442, Lot: 635. Closing Apr 17, 2019 at 1:31:40 PM ET. 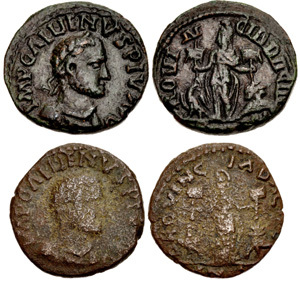 Lot of four (4) coins. 442, Lot: 662. Closing Apr 17, 2019 at 1:40:40 PM ET. MYSIA, Cyzicus. Gallienus. AD 253-268. Æ (25.5mm, 10.1 g, 7h). Aurelius Sostratos, strategos. 442, Lot: 663. Closing Apr 17, 2019 at 1:41:00 PM ET. 442, Lot: 669. Closing Apr 17, 2019 at 1:43:00 PM ET. TROAS, Alexandria Troas. Valerian I. AD 253-260. Æ (22mm, 4.42 g, 12h). 442, Lot: 686. Closing Apr 17, 2019 at 1:48:40 PM ET. IONIA, Smyrna. Gallienus. AD 253-268. Æ (28mm, 9.53 g, 6h). Marcus Aurelius Sextus, strategos. 442, Lot: 726. Closing Apr 17, 2019 at 2:02:00 PM ET. PAMPHYLIA, Perge. Gallienus. AD 253-268. Æ 10 Assaria (31mm, 16.07 g, 7h). 442, Lot: 734. Closing Apr 17, 2019 at 2:04:40 PM ET. PAMPHYLIA, Side. Gallienus. AD 253-268. Æ 11 Assaria (30.5mm, 14.49 g, 6h). 442, Lot: 738. Closing Apr 17, 2019 at 2:06:00 PM ET. PAMPHYLIA, Side. Valerian I. AD 253-260. 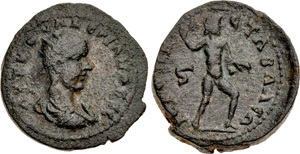 Æ 5 Assaria (32mm, 8.49 g, 1h). In alliance with Aspendus. 442, Lot: 746. Closing Apr 17, 2019 at 2:08:40 PM ET. Lot of two (2) coins. 442, Lot: 752. Closing Apr 17, 2019 at 2:10:40 PM ET. PISIDIA, Isinda. Valerian I. AD 253-260. Æ (24mm, 10.06 g, 6h). 442, Lot: 756. Closing Apr 17, 2019 at 2:12:00 PM ET. PISIDIA, Conana. Gallienus. AD 253-268. Æ 9 Assaria (36.5mm, 19.41 g, 6h). 442, Lot: 757. Closing Apr 17, 2019 at 2:12:20 PM ET. PISIDIA, Pednelissus. Salonina. Augusta, AD 254-268. Æ (23mm, 6.76 g, 12h). 442, Lot: 762. Closing Apr 17, 2019 at 2:14:00 PM ET. Lot of two (2) coins. 442, Lot: 779. Closing Apr 17, 2019 at 2:19:40 PM ET. CILICIA, Hierapolis-Castabala. Valerian I. AD 253-260. Æ (29mm, 20.04 g, 1h). 442, Lot: 783. Closing Apr 17, 2019 at 2:21:00 PM ET. CILICIA, Carallia. Gallienus. AD 253-268. Æ 6 Assaria (28mm, 10.47 g, 12h). 442, Lot: 787. Closing Apr 17, 2019 at 2:22:20 PM ET. CILICIA, Laertes. Salonina. Augusta, AD 254-268. 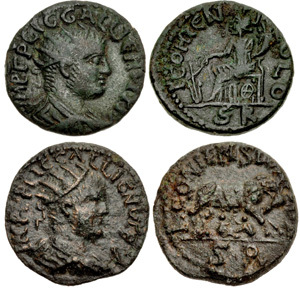 Æ 11 Assaria (31mm, 14.91 g, 12h). 442, Lot: 790. Closing Apr 17, 2019 at 2:23:20 PM ET. CILICIA, Lyrbe. Valerian I. AD 253-260. Æ 12 Assaria (33mm, 18.14 g, 12h). 442, Lot: 795. Closing Apr 17, 2019 at 2:25:00 PM ET. 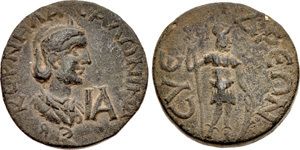 CILICIA, Seleucia ad Calycadnum. Gallienus. AD 253-268. Æ (26mm, 10.09 g, 7h). 442, Lot: 796. Closing Apr 17, 2019 at 2:25:20 PM ET. 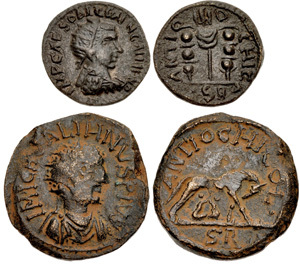 CILICIA, Seleucia ad Calycadnum. Gallienus. AD 253-268. Æ (30mm, 13.32 g, 6h). 442, Lot: 799. Closing Apr 17, 2019 at 2:26:20 PM ET. CILICIA, Syedra. Salonina. Augusta, AD 254-268. Æ 11 Assaria (27mm, 13.98 g, 7h).